The following diagram is useful for explaining how the MessageBox works in BizTalk server particularly when you are new to BizTalk. Remember that BizTalk uses the publish/subscribe messaging pattern for everything. Even for what appears to be synchronous message calls. Even Orchestrations subscribe to the MessageBox for the execution of those rules. Thanks to Dino Fassis for forwarding this onto me. Sorry I'm not aware who created this great diagram, but thanks to you for this great work. I'd like to say to a big thanks to the chaps over at JetBrains for once again giving me a free NFR (Not for resale) copy of ReSharper 6. If you have never heard of ReSharper or not quite sure what it is, I have written about this Visual Studio plugin multiple times in the past. here, here and here. There are quite a few new features in this latest release. Most of which are around support for ASP.NET MVC 3 and the new Razor view engine. 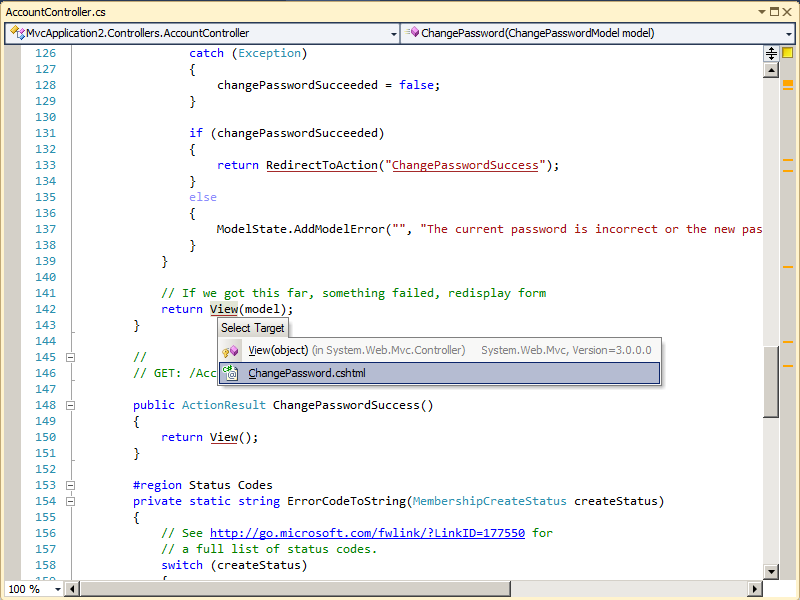 The above code will execute action method Register2 on the Controller that the view was generated from. 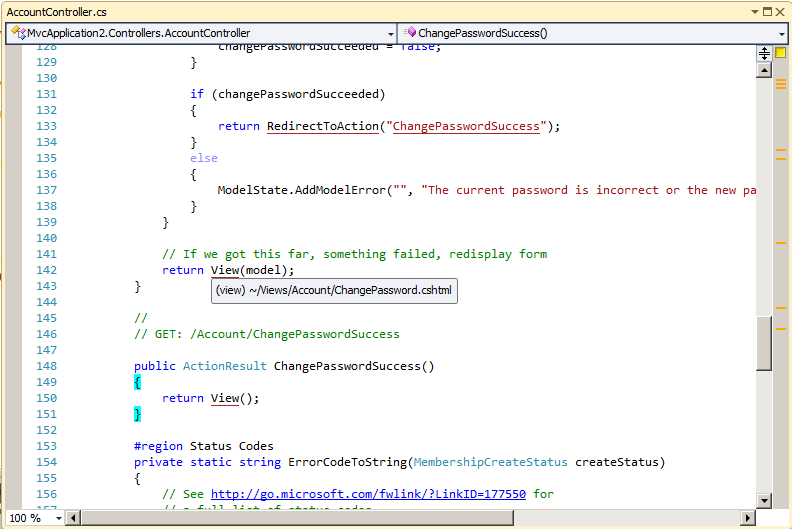 In this case the controller is the Account controller as this is the default application I am testing ReSharper on that gets generated from the T4 VS template for an MVC application. The above code will compile and run. You won't actually know that the above markup is in error until you actually run the application and browse that actual page. There is no tool support in Visual Studio that will tell you that this will error. In ReSharper 6 the above issue is prevented, not completely though. I'll show that in a minute. The above markup requires you to know how the view was generated, from which controller. that piece of HTML is actually from the LogOn.cshtml partial. Wouldn't it be neat if you could just click the Register2 action in order to navigate to it? Here we can resolve the view and navigate to it, which is great, but I'd really like to know the path of the view in some cases. Now after ReSharper 6.0 is installed (compatible with VS 2010) lets look at some of the above issues we had before. 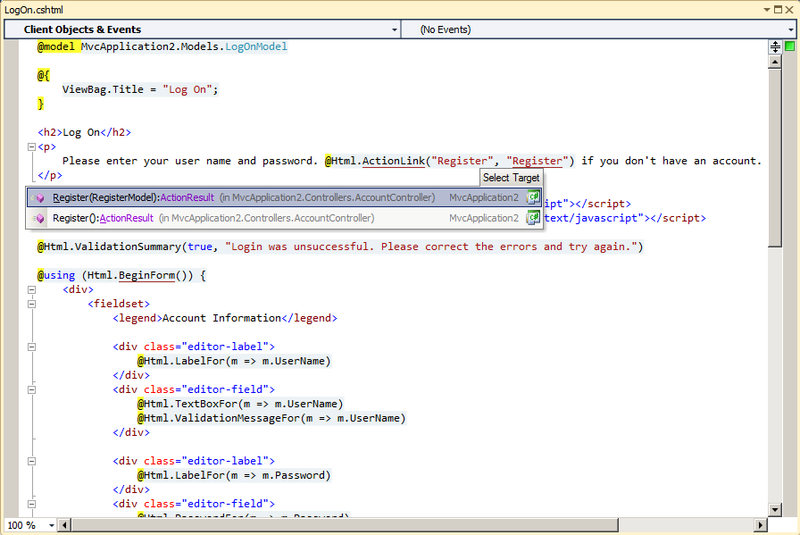 So now I have the familiar ReSharper support for just navigating to a method from a calling piece of code. 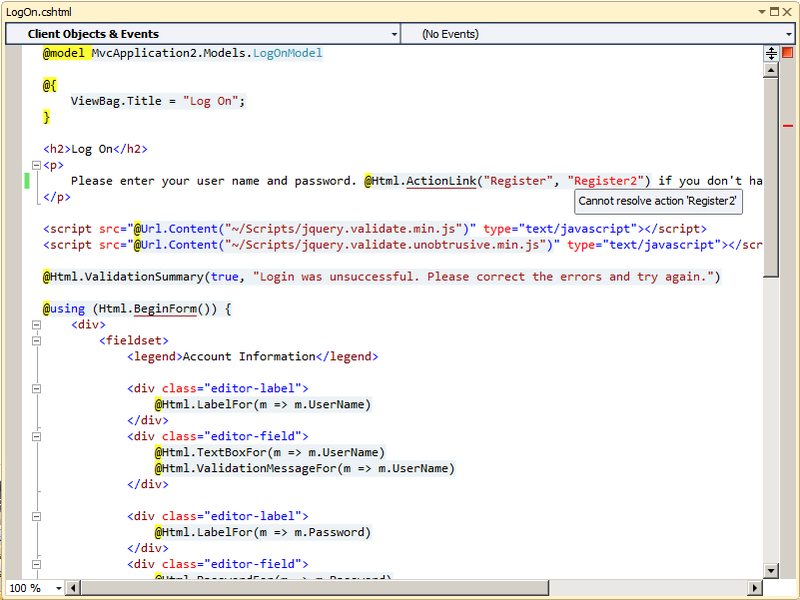 It just so happens here that ReSharper understands the routes setup within an MVC application. Also notice in this version of ReSharper the familiar "type" box, whether you get this via CTRL + Click or CTRL + T, now shows you the actual project the type lives. This is another powerful feature if the namespaces do not match up to assemblies. You can get the above menu displayed simply by pressing CTRL + then click the action. Pressing those key combinations displays a list of methods that match the action name for the controller that generated the view. To navigate to a given action, simply click the desired one in the pop up list, ReSharper will then open that source code and place your cursor at that method. Notice the above action name is underlined. 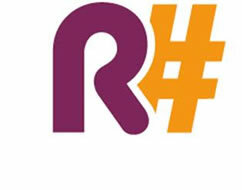 ReSharper uses this notation to signify that the action or type has been resolved successfuly. This is new when it comes to string types as the action name passed to the Html class is actually a string. 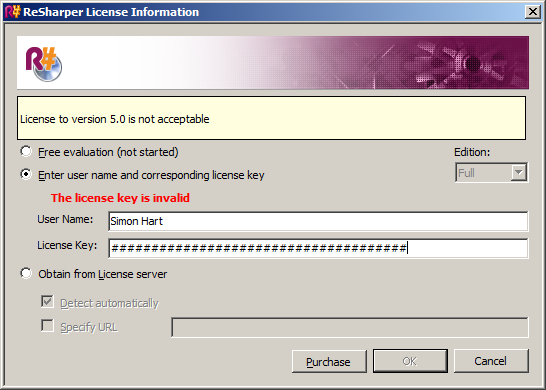 Figure 4: ReSharper 6.0 tells us when the action cannot be resolved! I really like the above feature. It can save you time. Also notice as the above error gets marked on the right side of the source window above, this is a standard ReSharper feature. Because it's been marked red, it means it's an error. Although the code will compile and run as before, ReSharper is doing it's best to let you know there is a problem and should be fixed. As we looked earlier, there is a bit of support for Controller to view navigation in ReSharper 5.1, but it gets better in ReSharper 6.0. I really like the above feature, it just means you have to think less! There are more features to ReSharper 6.0 but the above ones are the ones I thought were the best, enjoy! Back when .NET was released in 2001, the #region/#endregion feature seemed like a good idea at the time. I think it was more a novelty than anything. There have been many posts about #regions over the years. There was one I was reading recently that claimed #regions are a sign of code smell! That is pushing it a bit, they are not code smells but are very annoying and if I used #regions it might say something about my code. It might say that I write large bloat god type classes that need regions to split it up in order to maintain it more easily - that you could argue could *potentially* lead to a code smell. So now in order to understand this GodClass, I'm going to have to expand all those regions as I didn't write this code. All I want to do is get at the code to understand it, these #regions are preventing, or rather, making it more difficult for me from doing so. The title to this post reads "Removing the dreaded #regions using Visual Studio". So if you're in a shop that loves to use #regions or your code base is such that to remove all the #regions would be weeks of work, fear not! I didn't know this feature existed in Visual Studio up until a couple of days ago but you can actually turn off the *outlining feature* that makes #regions possible. As far as I am aware there doesn't seem to be support for this if you're using VB.NET. This only seems to be a C# feature right now. After the announcement of Windows 8 pre-beta at the Microsoft BUILD conference recently I was dying to install the pre-beta release of Windows 8. My client VM tool of choice of late is Oracle VirtualBox. I am currently running 3.2.10 on my production laptop and cannot upgrade for reasons that doing this will break existing VM's that I have. After searching the internet for this error, I came across the Windows 8 team blog post that lists the Virtualization technologies that are supported by this drop of Windows 8 here. 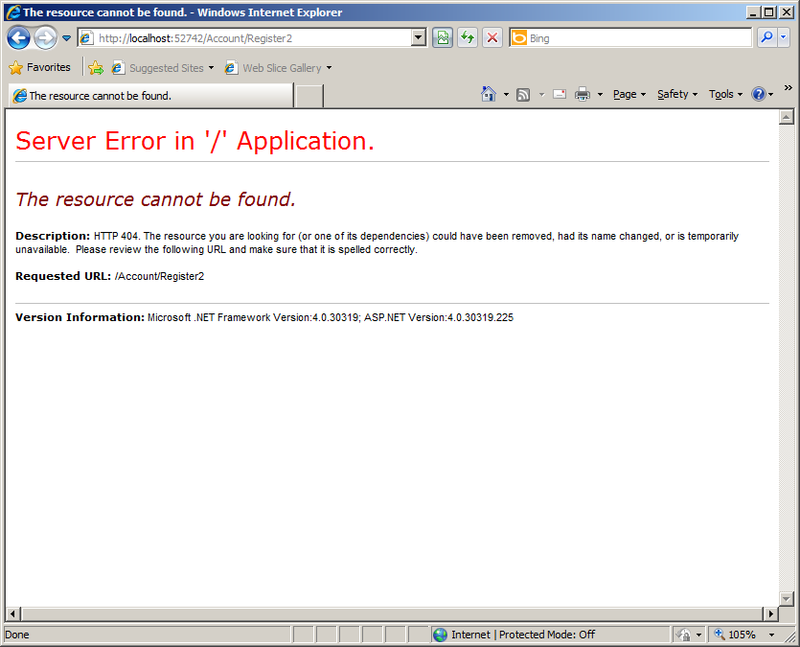 I recommend you read the blog post link above before installation of Windows 8 pre-beta. So the next thing I tried was to run the latest version of VirtualBox which is 4.1.2 on another machine as I couldn't upgrade my production laptop. After doing this and attempting the Windows 8 install again, I got another completely different cryptic error message which haulted the installation. The next thing to try (which is what I should have done to begin with) was to use one of my physical Windows Server 2008 R2 Hyper V box to host the OS and thankfully, it worked! !